Little Miss Bossy, Little Miss Sunshine and Little Miss Chatterbox are each treading the fashion walk this season in a new collaboration with Keds. The footwear brand has partnered with Sanrio’s popular Little Miss brand for a new line of sneakers featuring the characters originally designed and made famous by the UK author, Roger Hargreaves. First introduced through the popular book of the 80s, the Little Miss cast are known for their bright and happy outlook on life. Tapping into Keds’ passion for female empowerment, this collection of sneakers is designed to speak to the many roles women play in the modern world. “We are excited to feature such iconic female characters on our designs,” said Gillian Meek, president of Keds. “The collaboration is a fun and chic way to bring Little Miss to life, style-wise. Five Keds sneaker styles feature three Little Miss characters: Little Miss Sunshine, Little Miss Bossy and Little Miss Chatterbox. 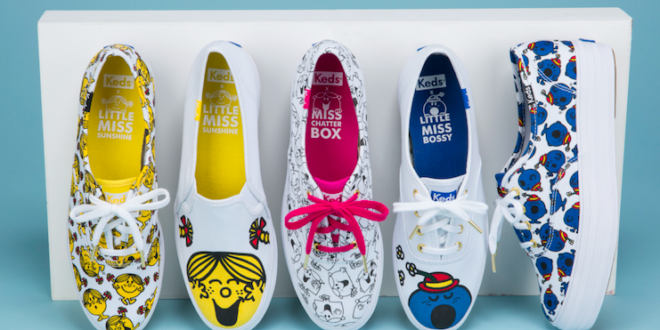 “We are delighted with the Little Miss collection and love how Keds has captured the essence of the brand,” said Alastair McHarrie, licensing director for Mr Men Limited. The collection will be available on Keds.com and globally starting on January 25th, 2018.